Danielle Morrill’s been thinking about this idea for at least three years. I know this because it was almost all she could talk for an hour straight at a dinner party several years ago. If you’re an entrepreneur and you get bit with an idea, you just can’t shake it. And so, after several years of apprenticing at building companies like Twilio, Morrill is finally striking out on her own with Refer.ly, a concept that’s been admitted to the next Y Combinator class. What’s the idea? On the web, there’s a whole secret $3 billion world of affiliate commerce where large online stores like Amazon reward other companies or people for referring them customers. Regular people don’t really have a part in this, so Morrill’s company Refer.ly gives them access. 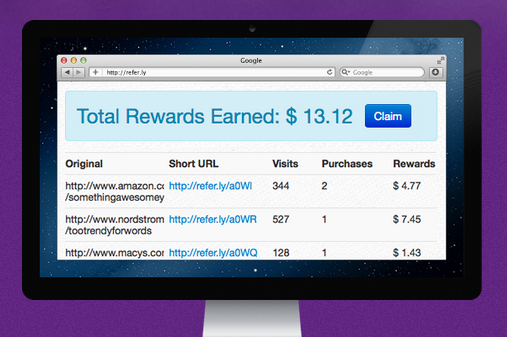 At Refer.ly, you can go and create special links that track whether you’re driving sales to other sites. If a recommendation does end up with a friend or family member making a purchase, you’ll earn a small commission (which usually ranges from a few percent to 10 percent depending on the product). If you make more than $10, you can take it out, donate it charity or share it with friends. She’s calling Refer.ly an ‘affiliate-for-everyone’ concept. It’s a basic product for now. Only the direct referrer earns the affiliate fee. So if you share a link and a friend of a friend of a friend ends up buying the product, you’ll be the only one earning the commission. She’s also giving up the entire affiliate fee to Refer.ly’s users for now. So the company’s not taking a cut. Morrill built a lot of the initial prototype herself. What’s impressive is her determination. She didn’t go to college and didn’t really see a need for it. But she knew that she wanted to be an entrepreneur. I guess you could say that she’s spent several years studying the art of building companies. She worked at one startup that was just too early for its time. Pelago made an early location-sharing app called Whrrl, but it didn’t have a ton of traction competing against media darling Foursquare. It went to Groupon in a talent acquisition. But a solid hit followed soon after. Morrill was the first non-founding employee to join Twilio, the company that lets developers hack and build applications using voice-over-IP, SMS and regular phone numbers. The company supports more than 30,000 developers and has raised more than $33 million in several venture rounds from Union Square Ventures and Bessemer Venture Partners. With Twilio CEO Jeff Lawson’s blessing, she stepped down to pursue her own idea. She recruited her husband Kevin Morrill, another co-founder Al Abut along with an engineer and a marketing specialist. Lawson’s an angel in the company and so is 500 Startups’ Dave McClure. There are, of course, a lot of questions. Will a few dollars in affiliate revenue motivate people enough to use Refer.ly? Don’t we just share products with friends and family because we genuinely love to help other people out? Morrill said she doesn’t expect Refer.ly users to make a living off the product. She’s just launching today to see how the market responds. “We’re at the beginning of YC, so I want to find out what people want now. It’s really risky to wait a couple weeks,” she said. Indeed. Move fast, and break things early.